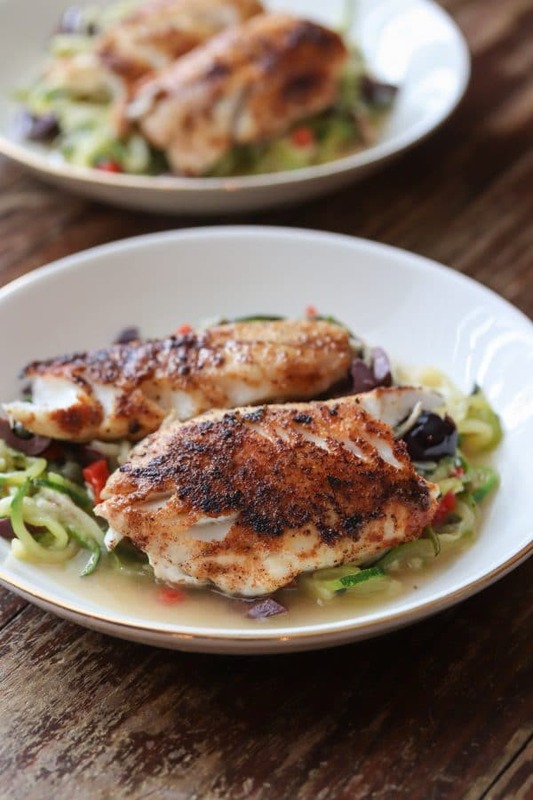 Delicious and healthy mediterranean seasoned Black Sea Bass served with grain free and low carb zucchini noodles. SO easy to make and ready to serve in under 30! 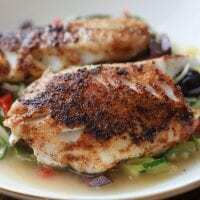 This black sea bass recipe first found its way onto my plate in May and then again a few days later. See, I wasn’t joking when I said it was delicious and easy to make. Two days in one week?! Who does that unless it’s leftovers? 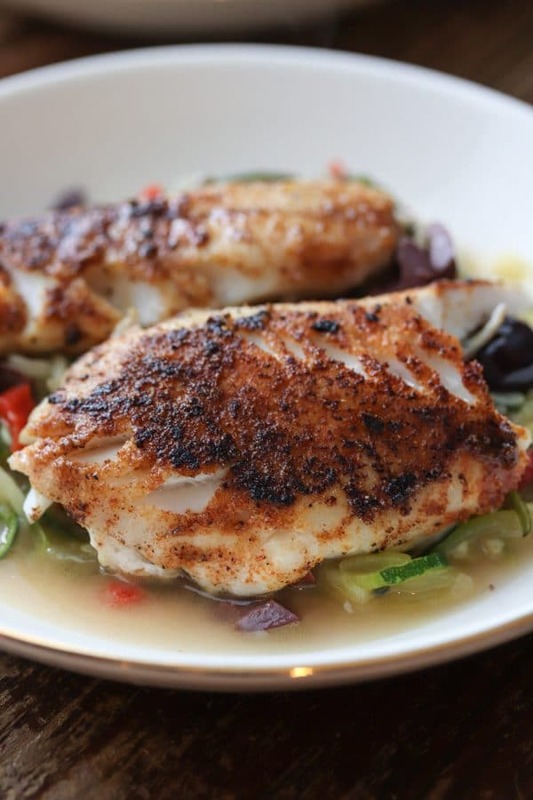 Black sea bass is seasoned with a mediterranean inspired seasoning and pan seared to flaky and tender perfection. Zucchini noodles AKA Zoodles are sautéed until tender and tossed with pimentos, capers, kalamata olives, lemon juice and butter. Put that pan seared black sea bass on top of those noodles and you have yourself one heck of a healthy dinner. I was going to share this black sea bass recipe with you much sooner than now but life happens. Like beginning a new job thanks to a promotion at the company I work for. Learning said new job (still in process). Going on a massive midwest road trip (hopefully writing a post about that!). Being lazy after work. Does that kind of stuff happen to you too? Let’s get on with the recipe now. I hope you enjoy this black sea bass as much as I do! Make the spice mix. Combine all spice mix ingredients and mix well. Prepare the sea bass. Dry the filets and then sprinkle each sea bass filet with 1 tsp of the seasoning mix. Set aside. Prepare and cook the zucchini noodles. Spiralize the zucchini noodles with the small noodle attachment. Sprinkle with sea salt, pepper and 1 tbsp of oil. Toss to coat. Heat a 10 inch cast iron skillet over medium heat and add the zucchini noodles. Cook until tender, about 5 minutes, mixing often. Tongs work well for this. After cooking reduce the heat to the lowest setting you can - you just want to keep the noodles warm. Add the pimentos, capers, chopped kalamata olives, 1/2 tbsp butter and splash of lemon juice. Toss to combine. Cook the sea bass. Heat 1 tbsp of butter in a 12 inch cast iron skillet over medium heat. If your sea bass has skin, place skin side down first and cook for 3 minutes. Flip over and cook for another 3 minutes. Flip back over and cook until the fish is flaky, 4-5 minutes. Plate your meal. Divide the zucchini noodles among two bowls. Top with the seared sea bass. 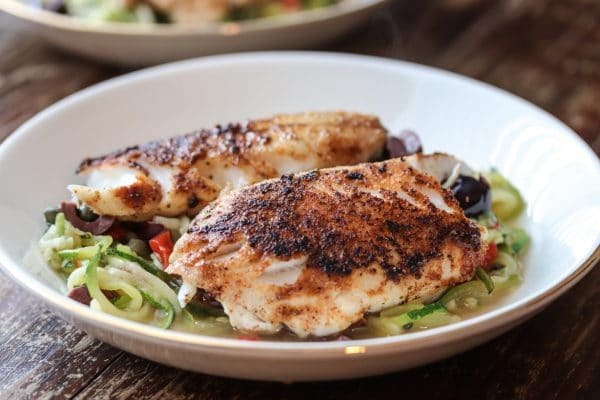 You can remove the skin from the sea bass before placing on top of the zucchini noodles, if desired Sprinkle with parmesan cheese or feta cheese if desired. This looks incredible! I love seafood but, ironically, I’ve never tried sea bass. I can’t wait to give your recipe a try. Thanks for sharing your recipe with us at Merry Monday this week. I’m always on the lookout for healthy meals that are still fast so this is perfect! That is a beautiful piece of fish – makes me want to go find a fork! Thanks for sharing at the What’s for Dinner party! This recipe looks delicious! Saving to my Yummy! board for you and our readers, thank you!!! Stopping over from Feathered Nest Friday. Looks so delicious and I love idea of using the zucchini noodles! Thanks for sharing with SYC. I can’t wait to try this recipe, it looks amazing! Hope you are having a great week and thanks so much for sharing with Full Plate Thursday! This looks luscious AND healthy!! I’ve had sea bass from restaurants that doesn’t look half this good! Thanks for sharing with us at Fiesta Friday!